Patrick Bowers has tracked down the country’s most dangerous killers– but one has never forgiven him. 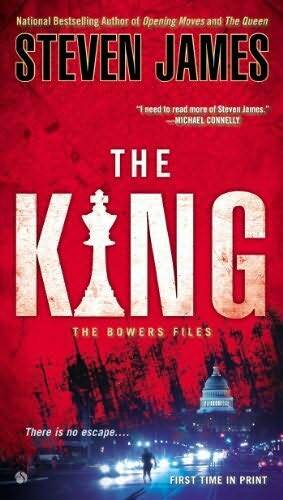 And so we have come to the last chess piece left in Steven James’ bestselling Bowers Files — The King. This book makes some very big advances for Patrick, his stepdaughter Tessa, and other characters that he grown to love or hate throughout the previous six books. It is hard to imagine how James keeps making every book in the series better than the one before it; but somehow, he does. And it amazes me. The characters and the plot are tightly woven together in this book that plunges the reader into the world of serial killers and of those who have a job to stop them before they can kill or hurt anyone else. One of the things I enjoyed about this novel was that James puts Patrick’s and Lien-hua’s romance on the backburner, and instead focuses on the relationship that Patrick has with Tessa. The readers gets to see Tessa really develop, and we get a hint at to what’s to come for Tessa (a Tessa series or standalone novel, anyone?). And Basque. Richard Devin Basque. The infamous cannibalistic serial killer that Pat put away over a decade ago, but was let go in a retrial. I really enjoyed finally being able to see him as a main player in the story instead of a backstory as he was in the other books in the series. As disturbing as it was to see things through his perspective, I think that it was necessary as I didn’t feel like I really understood how evil he really was. Also, I was very glad to see the return of one of my favorite characters in the series– Alexi Chekov, also known as the Russian-assassin-turned-terrorist. His role in the story was fascinating. As with all the other books in the series before it, The King will keep you turning the pages, and leave you eagerly waiting for the next book, Checkmate when it arrives next year.